As aurora borealis fills the night sky with fantastical light, and the eyes of those who came before look upon you, it has fallen on you to lead your village to power and prosperity. Now is the time to grow in numbers and strength, to build, to hunt, to look to the spirits of the white wilderness, and to prove yourself the greatest leader of the Snow Folk. 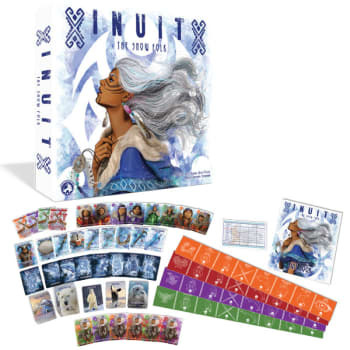 Inuit: The Snow Folk is a card-based strategy game of drafting and tableau building for 2-4 players.